303 AEROSPACE PROTECTANT really is like "SPF 40 Sunscreen...For Your Stuff." Regular use gives 100% Prevention of UV caused slow-fade. No other "protectant" beautifies as intensely, protects as powerfully, or lasts as long. Originally engineered for aerospace and aviation applications. The protectant is a premium surface treatment that provides superior protection against harmful UV rays that cause discoloration, fading, embrittlement, cracking, chalking and/or loss of mechanical properties. Safe and effective on vinyl, clear vinyl, gel-coat, fiberglass, carbon fiber, synthetic/natural rubber, plastics and finished leather. Good for use on dashboards, automotive leather, black plastic fenders, plexiglass, vinyl decals, door and trunk seals, vinyl convertible tops, boats and RV seats, Tonneau covers, Dacron sails, inflatable boats, spa covers, and much, much more! ABRACADABRA...THERE SHE IS....LIKE NEW AGAIN!!!! 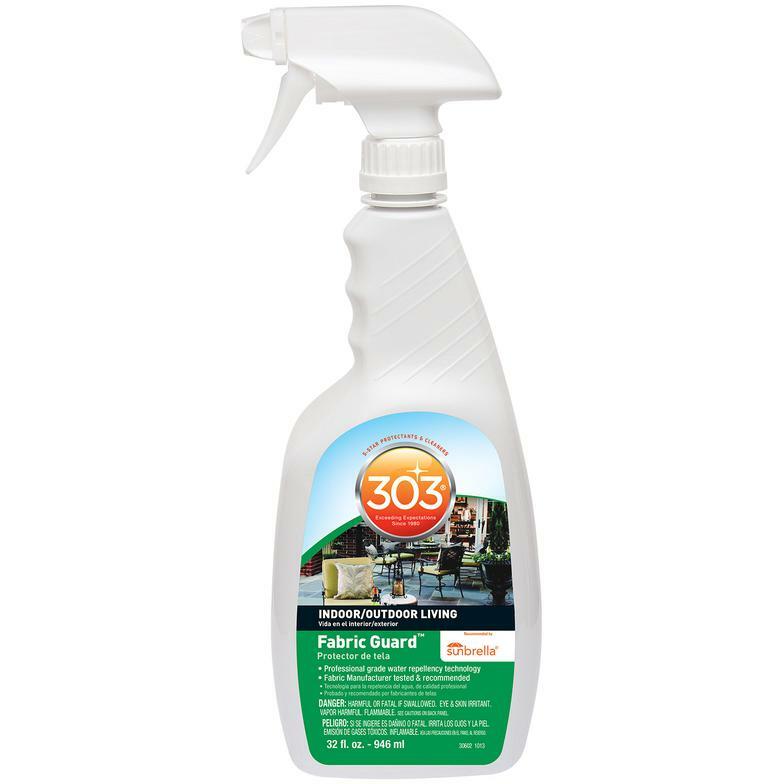 303 PFP IS SAE AND EFFECTIVE ON TEAK AND ALL PLASTICS, POLYETHYLENE, VINYL AND CLEAR VINYL, FIBERGLASS, EPOXY AND OTHER COMPOSITE RESINS, POWDER-COATED METAL AND STAINLESS STEEL. Restores lost water repellency and stain repellency to factory new levels. 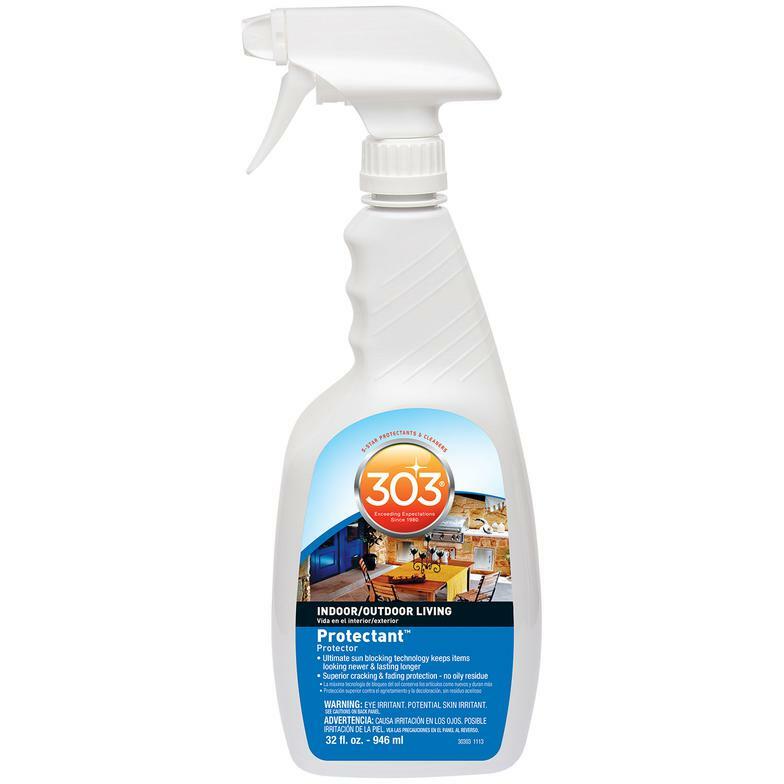 It stops leaks, resists soiling, protects against both water-base and oil-based stains and impedes mildew formation.